The Yokoyamas gather at the family home, coming together to commemorate the sad anniversary of the day their eldest son died while saving a drowning child. The younger son, Ryota, brings his wife and her son from a previous marriage for a very infrequent visit to the house in Yokohama. Ryota is keenly aware of the tensions and booby traps inherent to any trip to see his caustic mother and permanently disapproving father and does all he can to avoid them year round, but there is no avoiding this occasion. Ryota’s discomfort in the presence of his father is not something that has ebbed over time and his decision not to take up his fallen brother’s role as successor to their father’s medical career hangs over their relationship like a black cloud. The esteem with which the Yokoyama sire is held around their hometown only adds to Ryota’s sense of having let him down. Their dialog throughout the visit is stiff and cold, never breaking the surface of general niceties on the few occasions the men speak at all. Indeed, at the first sign of any disturbance to his carefully ordered routine, Yokoyama senior can be counted on to immediately vacate the premises for the sanctity of his office, or a long stroll about the neighbourhood. Mama Yokoyama is possessed of much more subtle ways of making her feelings known; backhanded compliments and off-the-cuff remarks that would normally be dismissed as old wives’ chatter find their marks wherever she lets the daggers fly, usually without the victim knowing if they should be laughing or hurt. Some of those on the receiving end of her roundabout barbs include her daughter-in-law, who has always worried that she would never truly be accepted into the family being a divorcee with a young son, only to discover on this visit her suspicions might be well-founded. Mama-san Dearest ever so sweetly dispels her son’s wife of any notion that she would welcome any grandchildren from their union. More insidious is Mrs. Yokoyama’s ulterior motives behind her annual invitation to the surviving victim of her son’s accident to attend the annual memorial gatherings for his saviour. His yearly obligation to visit the Yokoyamas and light incense for their lost son causes the young man no end of discomfort, which is obvious to all and small justice for the grieving mother. Don’t let its languid beginning and leisurely pace fool you, director Hirokazu Kore-eda lights boxes of fireworks within the frame of a single day inside a family home. There are no melodramatic familial explosions; the excitement is in the dialog, which spotlights humourous situations common in every household and moments heavy with the simmering tensions of all the recriminations, justified and otherwise, that parents, children and siblings never say. All of this is delivered in most genteel and circumspect tones of a clan of older parents and their grown children along with their own families, all trying to get along for the day. Every actor is rock solid; Hiroshi Abe conveys the right amount of resigned frustration as the son who will never be good enough to receive his dad’s approval, segueing into a tender acceptance at the discovery that even his monolith of a father must get old some time. Singer/actress You plays the dutiful daughter with an almost preening pride at being the one closest to the parents, but takes for granted that she understands her place in the future of the family home. Veteran actor Yoshio Harada has precious few words of dialog in Still Walking and doesn’t really need the ones he has to steal his scenes as the irascible head of the Yokoyama family. His grouchiness in the face of this yearly invasion of loud children and grandchildren is hilarious, as is his self-satisfaction after discovering a secret bond with Ryota’s aloof, precocious stepson. An imposing figure, his impotence in the middle of a medical emergency later in the film is particularly poignant as his last point of pride, his neighbourhood standing, is shaken. As fine as Harada’s performance is, the film really belongs to Kirin Kiki as the Yokoyama mother. The actress deftly reels off deadly verbal slings and arrows that have the advantage of coming from the ignored, underestimated source of the mother, who by virtue being ever-present is invisible to her family. Cunning as a CIA agent, the deceptively mundane rituals enforced on her family and others are filled with Shakespearian agendas. Mother Yokoyama’s pain and eternal grief at the loss of her firstborn is carefully hidden as she carries out an indomitable will with sweet-faced passive aggression. Her explanation of why she insists that the young man her son died fifteen years ago to save must be corralled back to Yokohama year after year is chilling. It is possibly the only time this woman has ever let her anger at the circumstances of her son’s death show and Kiki elevates the scene to the level of Greek tragedy. Her heartbreak and rage as she nonchalantly reveals her motives is hypnotic and completely compelling. Kore-eda brings out more bombast in the quiet of a living room than I’ve seen from all this year’s summer blockbusters combined. 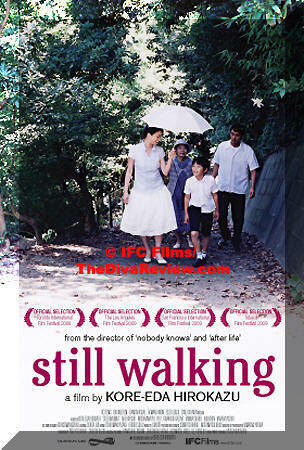 Mesmerising and lyrical, Still Walking is a triumph of mood and storytelling imbued with some of this year’s finest performances.